Even a rag-tag group of outlaws need a place to call home, and in Red Dead Redemption 2, that’s the camp you make throughout the game. It’s not just a place to lay your hat though; the Van der Linde settlement boasts a wealth of activities. From fun diversions to keeping Arthur clean and groomed, having a few parties and settling a few disputes, you’ll have plenty to keep busy with. To unlock all this fun, however, you’ll need to how to upgrade your camp in Red Dead Redemption 2, as well as figuring out how to use the ledger and unlocking the Leather Working Tools. The Ledger is the hub of your camp in Red Dead Redemption 2, and everything runs through there. 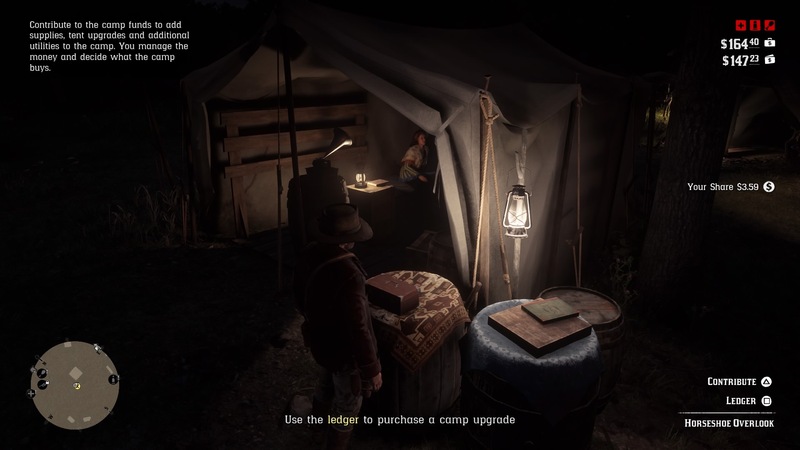 You can find the Ledger at the back of Dutch’s tent in camp, right beside the money box. Just walk up to it and press Square on PS4 or X on Xbox One. We’ve heard reports of people getting stuck inside the menu and not knowing how to get out, so once you’re inside of the menu you need to hold circle on PS4 or B on Xbox One to exit the Ledger. At the Horseshoe Overlook camp, there are seven main things that you can upgrade in your camp. They’re represented by different icons on your map. 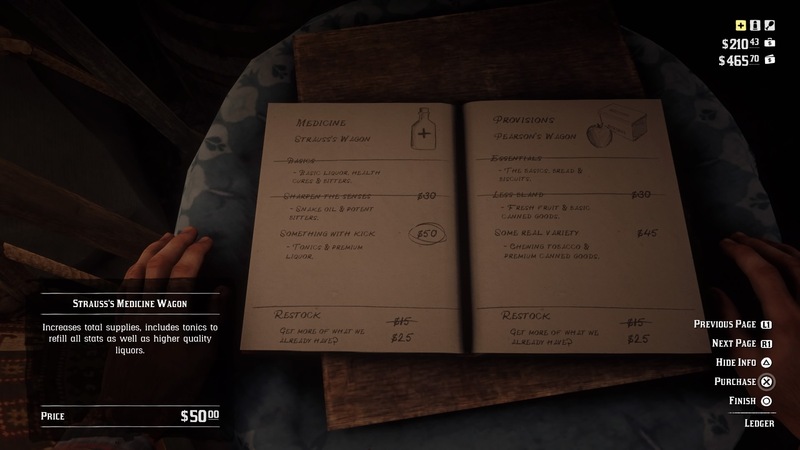 In addition to icons for Arthur’s tent, Mr Pearson’s cooking station, and minigames like poker and Five Finger Filet, you’ll see a number of supply icons. With Medicine, Provisions, and Ammunition, upgrading each of these areas stocks your camp with a variety of items. You don’t have to pay for any of these items once you’ve paid for the upgrade, just walk over to the icon on your map, and you can collect any healing items, ammo, or food that you need. From then on, you just need to pay the restocking fee to collect more. Lodging is a really important area to invest in. After you’ve upgraded Dutch’s tent – which makes your fellow campers toss more moolah into the shared kitty – the “Next in Line” upgrade unlocks Red Dead Redemption 2’s fast travel system for $325. The Horse Station is another useful upgrade. If you ever lose your trusty steed, then this upgrade lets you call them back to camp. It also lets you manage your owned horses more conveniently, letting you retrieve stabled horses more quickly. Eventually, as you progress through the main story, you’ll unlock the ability to purchase the world’s most expensive row boat which, at $450, isn’t exactly cheap. If you’re big on fishing, this could actually be a fun camp upgrade to pick up. At least it means you’re not scuttling around on the bank of lakes and rivers trying to catch fish all the time. Finally, the Chicken Coop is a must for fans of the Dead Eye system. It imbues the stew that Mr Pearson cooks for the gang with a boost to your Dead Eye meter, which is useful in a scuffle. Plus, good news for poultry people – you can visit your newly acquired chickens as they cluck and pluck around. On the last page of the Ledger, you’ll find an option which lets you buy Leather Working Tools for $225. This gives Mr Pearson the ability to craft upgrades for your satchel from his stall. As well, Mr Pearson can craft cosmetic items for your camp using the pelts you collect from hunting. To start, you can craft rugs, tablecloths, and throws for Arthur and John’s tents, in addition to communal areas and camp vehicles. If you need help grabbing perfect pelts, we’ve got a full guide page on how to get them every time. Want to find the best weapons, a better horse or some more gold bars to upgrade your camp with? Then check out our Red Dead Redemption 2 guide for more tips, tricks and walkthroughs. Red Dead Online will be available to all players soon, so here’s Red Dead Online beta guide, with tips and tricks to get you started in the single-player story missions and multiplayer modes, how to unlock all the weapons, Ability cards and more. 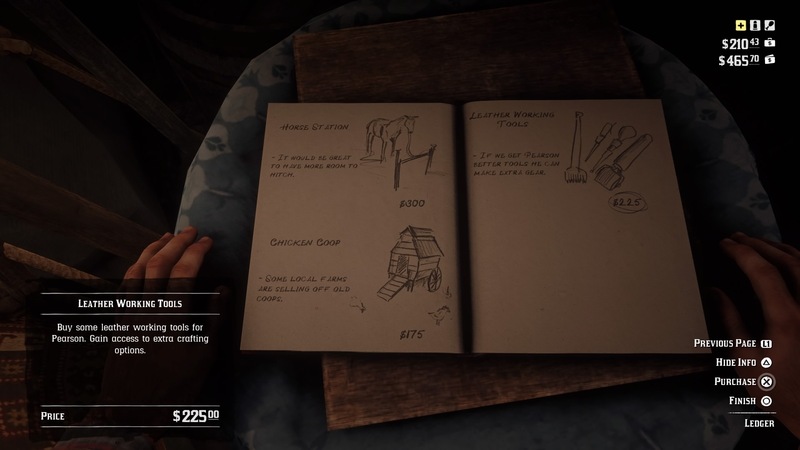 The post Red Dead Redemption 2 Camp Upgrades Guide – tips, ledger, and leather working tools appeared first on VG247. Can the dead Starks in the Winterfell crypts really rise when the Night King comes?